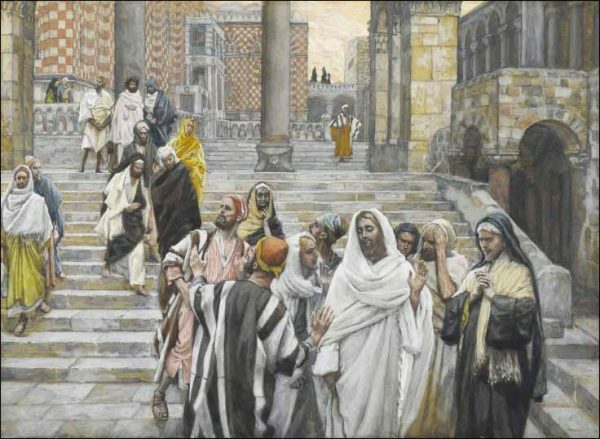 This Friday’s Gospel was Matthew 21:33-43.45-46, the parable of the tenants in the vineyard. At the end of the story Jesus quotes Psalm 118: “Did you never read in the scriptures: ‘The stone that the builders rejected has become the cornerstone; by the Lord has this been done, and it is wonderful in our eyes’? I’ve long wondered about the literal meaning of that verse. Was it referring to an actual event, a real story about a real stone, perhaps in the building of the Temple? What would it have meant to the original Jewish listeners? I’ve been frustrated because all the commentary I’ve seen skips right over the literal meaning of the story and jumps to talking about how Jesus is the fulfillment of the Scripture, the stone rejected by the builders. That’s all very well and good, but I was taught to begin with the literal meaning and to work my way up to the typological meaning, not to begin with the type-antitype. ABOUT A THOUSAND YEARS BEFORE CHRIST, King Solomon built the Temple in Jerusalem. All the stones for the Temple were precut at the quarry and delivered to the site. We can read about that in the Old Testament book of First Kings. But elsewhere it’s recorded, that one day a shipment arrived that included a large stone with a very odd shape. The foreman, the construction administrator, the architect, the priest in charge of the work– they all said, “What are we supposed to do with a botched-up stone like that? They must’ve made a mistake at the quarry!” So the builders had the unusual stone dragged over to the side of the jobsite, to be hauled away with the rest of the rubbish once the Temple was completed. So they went and looked at the rejected stone. They brought it back and lifted it up and sure enough, it was an exact fit! The stone the builders rejected turned out to be the capstone of the whole Temple! And all the people, from King Solomon to the lowliest slave, marvelled at this. They recognised that the Lord had done this, to remind them that His foolishness was wiser than their wisdom, and His weakness better than their strength. The builders had meant well. They wanted the Temple to be built. But they’d let their own ideas about how it should happen blind them to the way the Lord wanted things to be. They had to humble themselves and repent. And from what we read of the joy at the Temple’s dedication, I’d say they were happy to do so. The verse was written by King David in reference to himself. When Samuel the Prophet was sent to Jesse’s house to choose a king from among his sons (I Samuel 16:1-13), Jesse brought all his sons before Samuel except for David, the youngest, who was in the fields tending the sheep. Samuel thought that G-d would choose the oldest son, but G-d told him, No, I have rejected these. Finally Samuel asked, Do you have any other sons? And Jesse sent for David. G-d said, Arise and anoint him, for he is the one. David was thus the stone rejected by the builders Jesse and Samuel, and he became the cornerstone of the great dynasty of Jewish kings. The application to King David could have been a secondary allegorical meaning added to the story of the stone of the Temple by a later author. Obviously David himself could not have been writing about the Temple, which was built by his son Solomon. So I’d have to think it was a secondary author writing in the style of David and attributed to David. But I still really like the story about the stone referring metaphorically to King David. And then when we look at the typological meaning, David is a type of the messiah, the Christ, and so there’s another layer of meaning when Jesus refers to himself as the stone, he’s also then referring to himself as the Davidic messiah. I will enter and thank the LORD. through it the righteous enter. you have been my savior. So, if the story about the rejected stone that was found was common knowledge, then you can imagine people singing the song as they go through the gate into the Temple and looking up at the stone and remembering the story about the construction and how it was lost and then found. Doesn’t that give you shivers? To me the psalms come alive in a completely new way when I picture the Jews singing them in the Temple or as they climb up to the Temple. And I remember too that Jesus would have sung these songs as he walked to the Temple with Jospeh and Mary for the great feast. 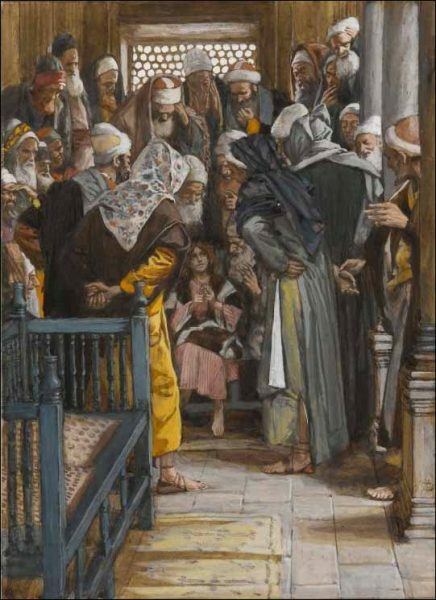 This acclamation, “blessed is the one who comes in the name of the Lord,” is sung to Jesus on his way to Jerusalem by the people who lay palm branches at his feet and wave them in the air. Not only do the psalms anticipate Jesus, they also accompany him on his journey, they are the music to whose rhythm he trod the earth when he was a man. He sang them. He prayed them. And how wonderful it must have been for Mary and Joseph to hear those prayers on His lips. But now, having established possible literal and metaphorical meanings of the stone, let’s get back to the Gospel of Matthew. The odd thing here is where Jesus quotes that Psalm. It seems almost like a non-sequitur after the parable of the tenants who kill the son, thinking they can thereby have the inheritance. Why, when he has thus far been talking about vines and vineyards, does Jesus suddenly switch to this architectural metaphor? In any case, since they seem miss the significance of the dead son, that’s when Jesus underlines it with the bit about the stone the builders rejected. Essentially he’s saying: I am the son, I am the stone. You’re trying to build without God. You are trying to take my inheritance by killing me. Jesus tells these stories back to back for a reason. I’d never really thought about that before. Partly, I didn’t see it because I lacked the context. I wasn’t reading it through the lens of the Psalms and the Old Testament verses and images that Jesus is referencing. Both the parable about the tenants and the lesson about the stone rejected by the builder are directly quoting the psalms. And in both, if you have eyes to see it, you can see that Jesus claims to be God at every turn. and the word of the LORD proved him true. who is betrayed by his brother, stripped of his clothes, put into a well and sold for 20 pieces of silver. So in Psalm 105 the king who releases Joseph and makes him master of the house is a figure of God the father and Joseph is the chosen son who distributes the Father’s goods to the people so they don’t starve. Who literally gives them bread. Now going back to the Gospel, the tenants who kill the beloved Son to steal his inheritance are like Joseph’s brothers who want to take his inheritance, who are jealous of the father’s love and favor for him. As if killing him could win them the love that was his portion. Well the tenants think the wine is their inheritance. Don’t they? Wine as a substitute for real love. And this image of the tenants who kill the son so they can keep the wine for themselves instead of turning it over to the vineyard owner is a very serious indictment of the priests, isn’t it? You don’t even want the love of the father, Jesus accuses them. You idiots just want the wine. You’re only interested in the material goods you get out of this priestly gig. Ouch! But also… one of my favorite moments, a classic trope from tales where the villain pronounces his own sentence, Jesus has the priests and pharisees speak their own indictment: “What will the owner of the vineyard do to those tenants when he comes?” he asks. What’s more, they realize it! When the chief priests and the Pharisees heard his parables, they knew that he was speaking about them and they were enraged. He tricked us! Because it was true and they hated it. No wonder they wanted him dead! He kept poking them in the eye. He kept trying to get them to acknowledge their guilt and turn back. But no matter what he tries, it only makes them angrier. Harder of heart. Finally, when we were reading the Gospel Sophie remembered another story Jesus tells about a vine, where he’s no the vineyard owner’s son, but, somehow, the vine itself. I am the true vine, and my Father is the vine grower. He takes away every branch in me that does not bear fruit, and every one that does he prunes so that it bears more fruit. Anyone who does not remain in me will be thrown out like a branch and wither; people will gather them and throw them into a fire and they will be burned. By this is my Father glorified, that you bear much fruit and become my disciples. How can one thing mean two things at once? Sophie asks. How can the vine be Israel and Jesus? I asked her a different question: How can water symbolize both life and death? We talked about how without water to drink we will die. Without water all our plants and animals will die. Water is life. But if you fall into the ocean you will drown and die. Water can be deadly. Likewise fire can be life-giving when it keeps you warm in winter, but it can kill you if you are stuck in a burning house. Many thoughts to ponder from just one day’s readings. I need to stop and read more carefully with the children more often. I love finding little signs in the Old Testament that point to Christ. It’s like a treasure hunt. Father Richard Simon who has a show on Relevant Radio called “Father Simon Says”, spoke of going to the Holy Land and discovering that Calvary was built on an abandoned stone quarry; literally the stone the builders rejected. Father Simon said he got chills when making this discovery. So many clues and beautiful insights! Lovely research but I wondering is this literal story contradict and doubt our believe of Jesus he is the cornerstone ? To read the passage wherein Jesus refers to himself as the cornerstone of the Temple one must first begin with the literal Temple, which God ordered built as a reflection of heaven on earth. This Temple had a stone which was rejected, Jesus refers his listeners to that stone and they must have known the story he is referring to. Then Jesus calls them to understand the spiritual meaning of the stone rejected by the builders as having its fulfillment in himself. But the image could not be understood by his audience if they did not first know of the Temple and of the stone. I marvel at the words of Jesus… He used an historical reference to illuminate a spiritual concept… 1Cor.3:16 ff… believers (plural) are the temple (singular) of God. As stones “fitted” together, we comprise His temple, but our structure is secure only as the “Cornerstone” is our foundation. The “physical” Jewish temple was destroyed to make way for a new “spiritual” Temple in Christ. Jesus & his followers have been ridiculed by society for decades, but His triumph & glory are manifest in the many who follow Him to the death.